Heat a cast iron skillet on high heat. Dry off rib chops completely and season with salt and pepper. Add oil to the skillet. Sear lamb until browned on both sides. Meanwhile, in a small saucepan, heat balsamic vinegar, red wine and a sprig of rosemary until halved in volume. Remove rosemary sprig and stir in butter. 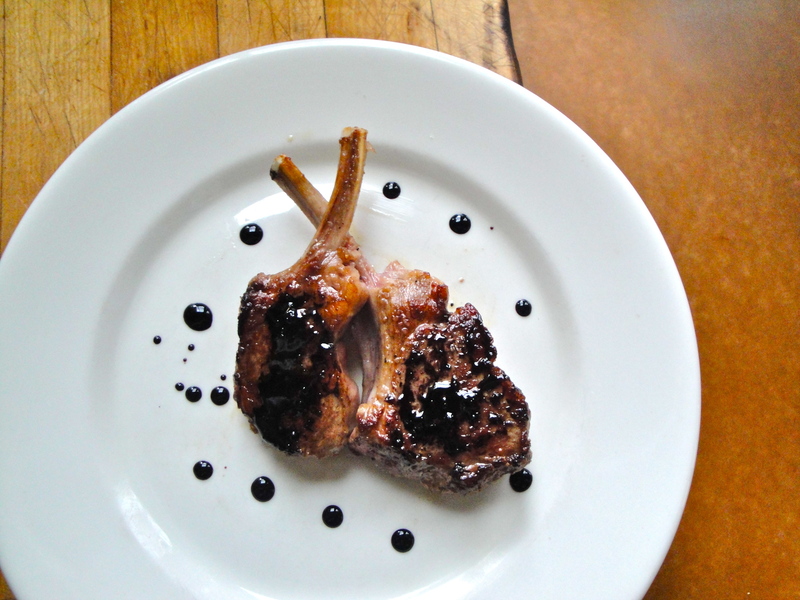 Drizzle balsamic reduction on lamb to serve. 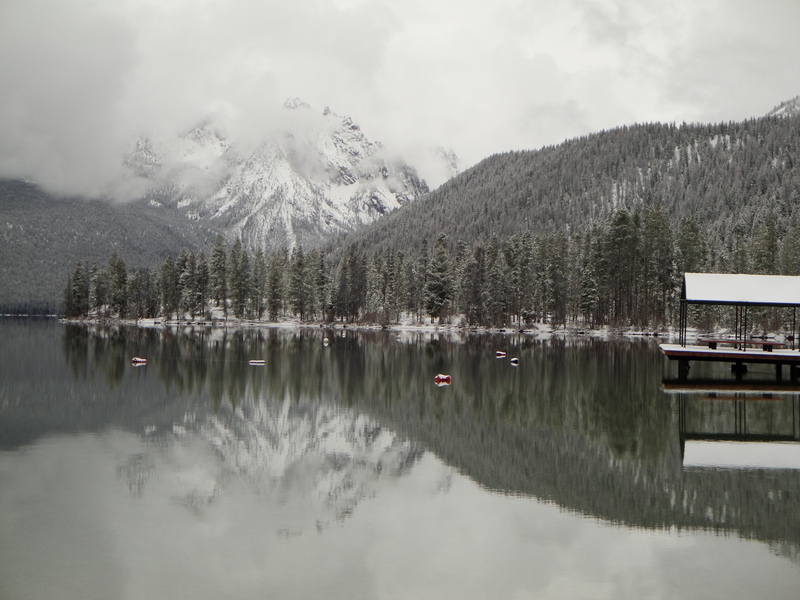 This past weekend, several Lava Lakers drove through a mild snowstorm (only three inches in late May, no big) to Redfish Lodge for Idaho Conservation League‘s annual Wild Idaho conference. We ate well, learned much from fellow attendees and drank lots of tea to stay warm. 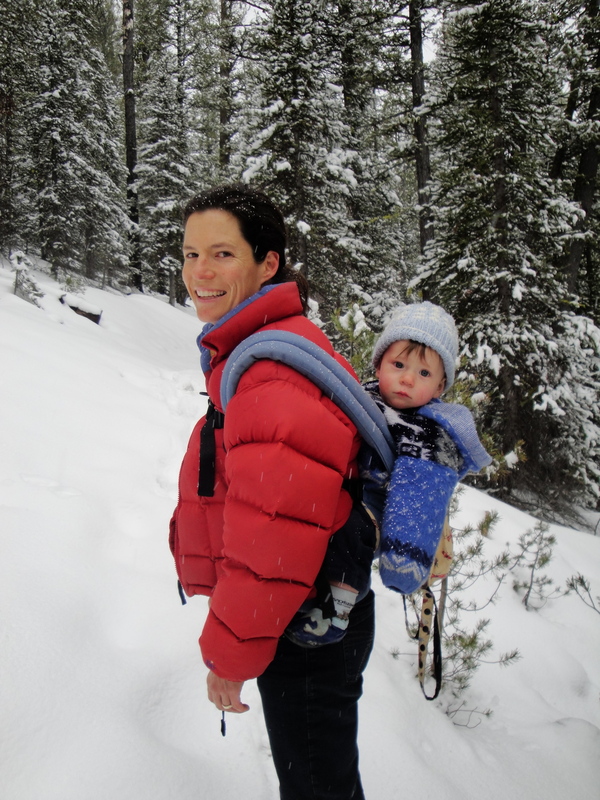 We even reintroduced the concept of snow to baby Duncan. Tess and Mike both presented at the conference. 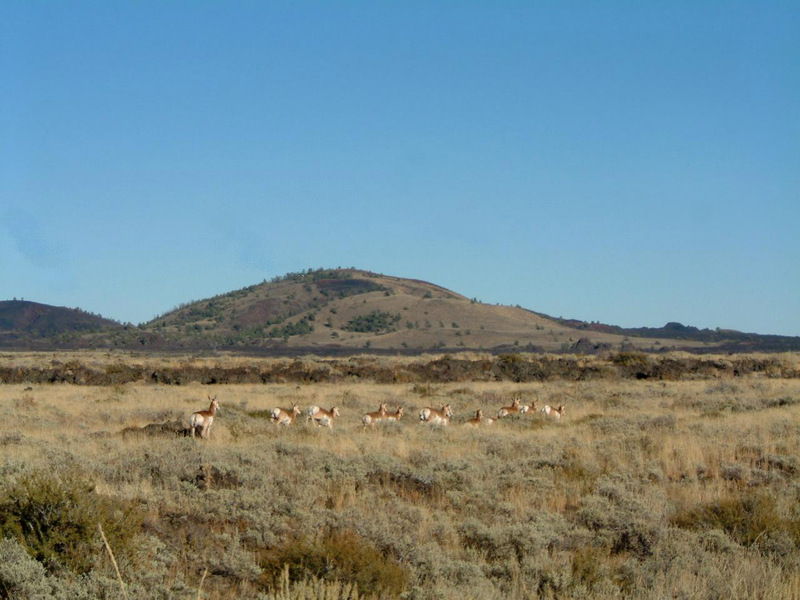 First, Tess talked about our glorious Pioneer Mountains-Craters of the Moon landscape. 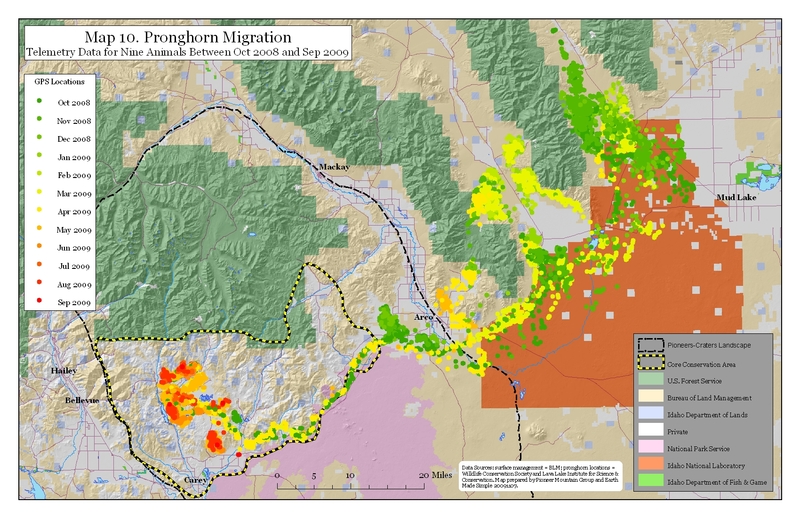 She then told the story of our pronghorn migration study and showed a new google earth video we recently created (we promise to post it, once we tweak it a bit more). 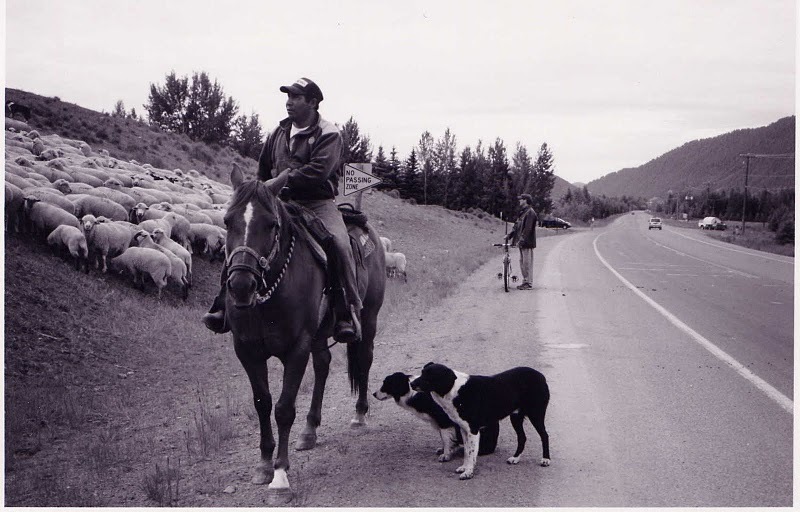 Mike then talked about the Pioneers Alliance, a coalition of ranchers, conservationists, scientists, business people, and elected and agency officials. 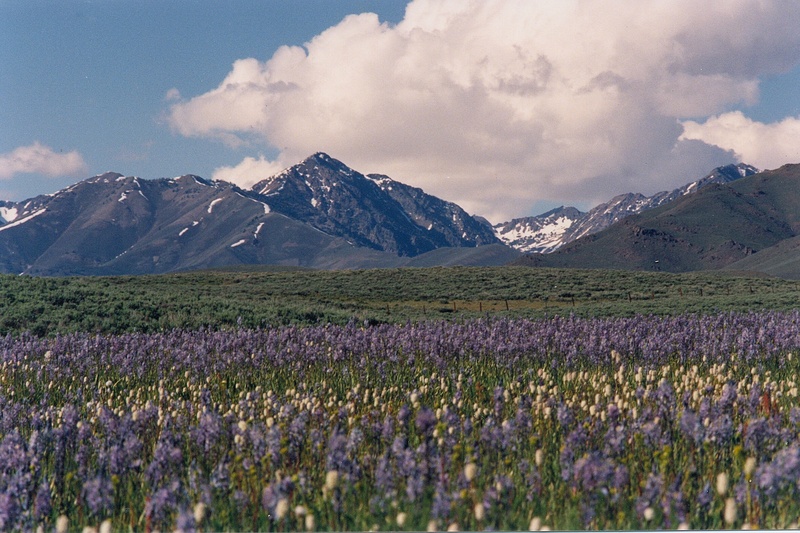 The mission of the Pioneers Alliance is to protect the working farms and ranches and surrounding public lands that, through community-based stewardship, sustain the rugged and unspoiled nature of the land and wildlife of the Pioneer Mountains to Craters of the Moon landscape. 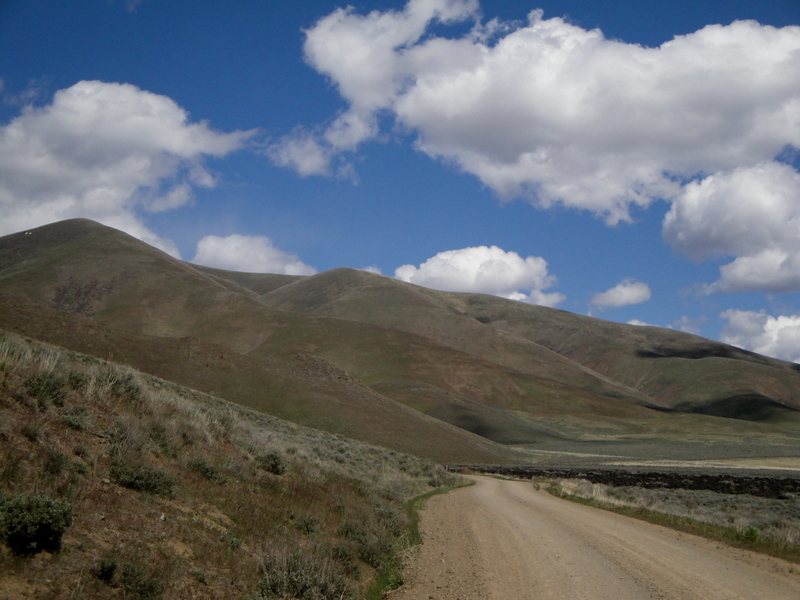 We had a wonderful weekend celebrating Idaho’s wild places at one of the most scenic spots in the state. 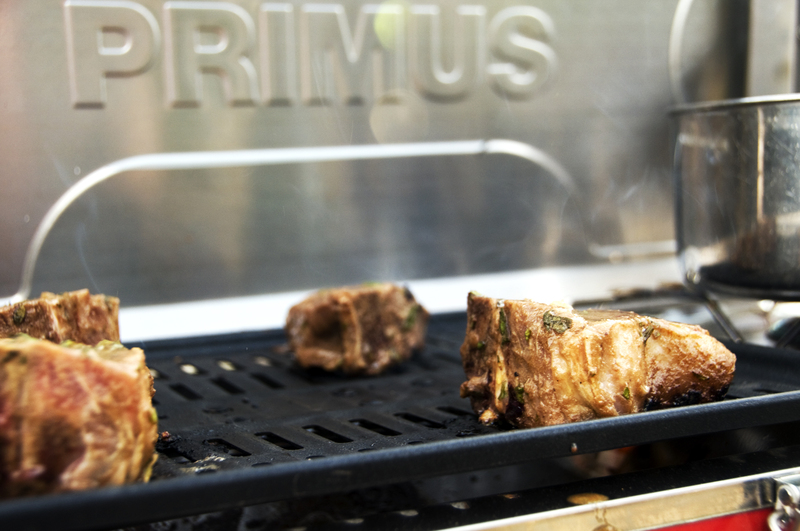 To receive your lamb in time, you’ll need to order online today or call 1-888-528-5253 by Monday. Happy grilling! Idaho is dry. Sometimes it rains, and it is very exciting. 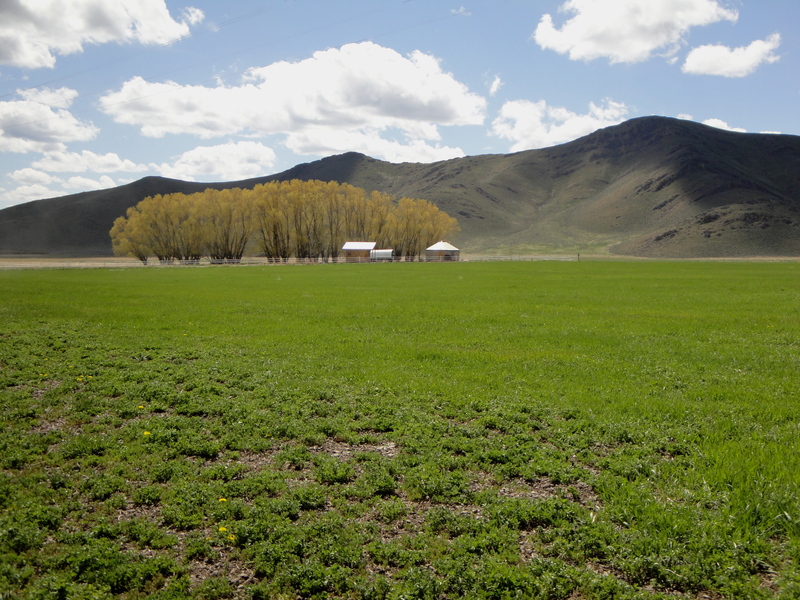 Our eyes are habituated to shades of brown/sage green, but every spring, we get a brief glimpse of real green. Last week, we invited a new friend out to the ranch, dined on lamb burgers with tzatziki and walked around our almost-bright-green hills. It had rained all week, so imagine our delight in seeing some sunshine coincide perfectly with the arrival of our guest. What better place to grill than right outside the yurt? 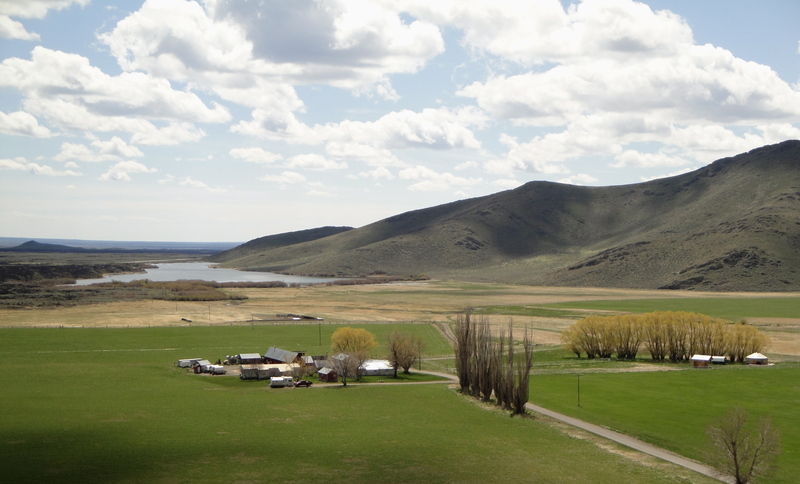 View of the Ranch from Will’s Hill. 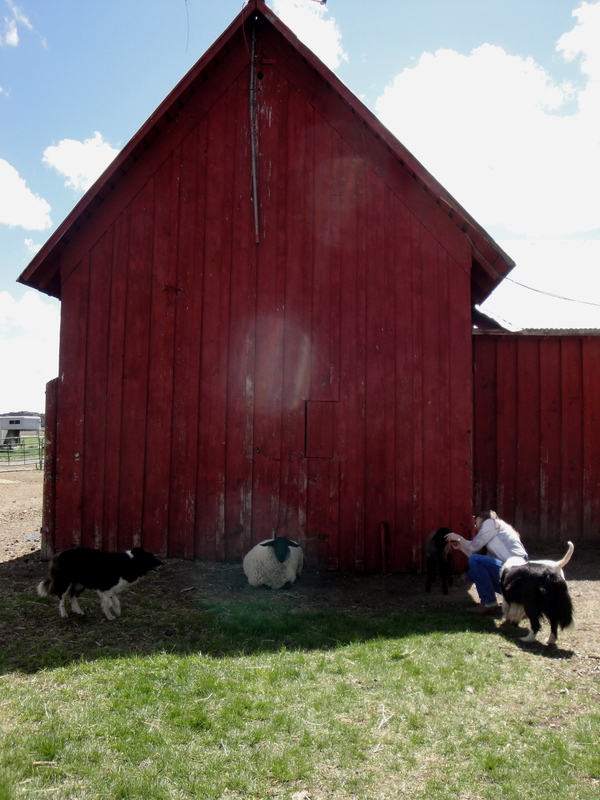 Cheryl attracts a small gaggle of animals. For special occasions, nothing beats rack of lamb. It is simple, elegant and so delicious. I had an old friend come out to visit Idaho a few weeks ago. I wanted to serve her something really special as a thank you for making the long trek out here, so it had to be rack of lamb. I went with this Gourmet recipe, which accompanies the lamb with a few herbs and garlic, as I wanted to keep it simple. 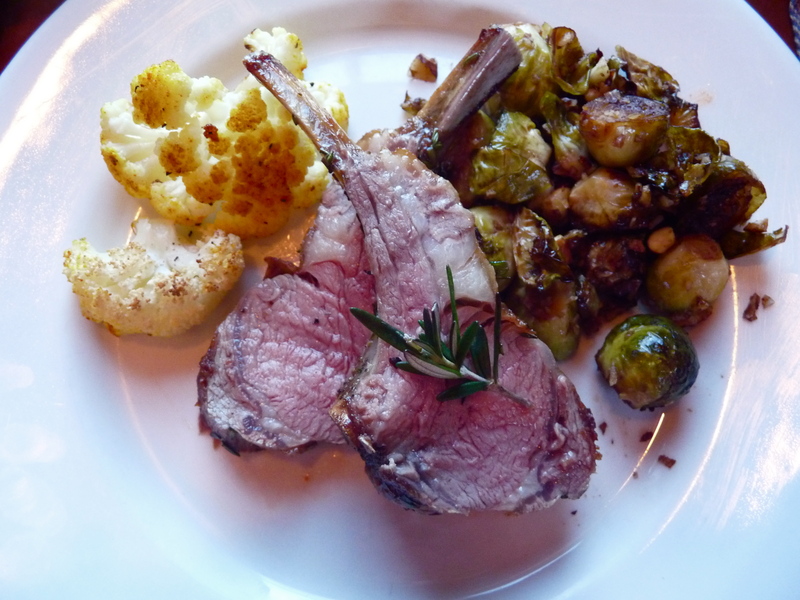 Rack of lamb is so good, you don’t need want to cover up the delicate flavor with too many ingredients. The dish was lovely and well received by everyone. The luxurious taste of rack of lamb paired with fresh herbs made our reunion dinner quite memorable. Heat a large cast iron skillet over high heat. Pat lamb dry and sprinkle on both sides with salt and pepper. Heat oil in skillet. Add lamb to hot skillet, and brown on both sides. Stir together garlic, herbs, salt, pepper and olive oil. Coat the meaty part of the rack, by pressing this mixture onto lamb. 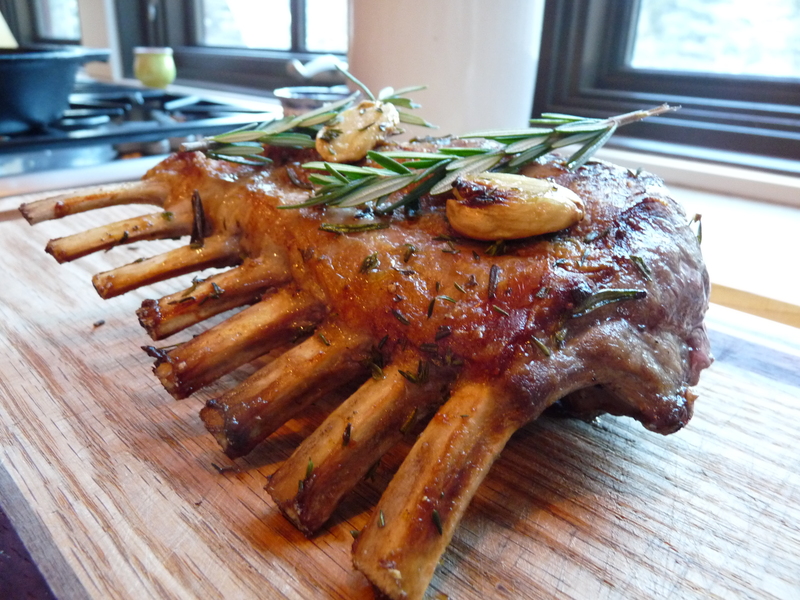 Place lamb into oven and roast for 15 minutes. Cover with foil, and roast about 10 minutes more (check with a digital thermometer until internal temperature reaches your desired doneness. Remove from the oven and let the lamb rest, while covered for an additional 10 minutes.